There are two reasons why PowerPoint files might fail to load. 1) Some files are too big or have too many slides and max out the memory on the iPhone or iPad. While the file might be several megabytes, the uncompressed data can be much bigger. We keep working to make Presentation Viewer handle larger and larger files. 2) We use PowerPoint rendering technology built in to Apple's iOS software. Sometimes this won't load all different kinds of PowerPoint files. 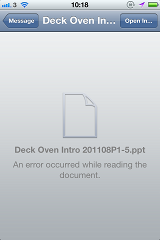 Try emailing the presentation to yourself and opening it from the Mail app or Safari. If you see a screen like the one below, it means Apple's iOS software can't load your file. Try saving it again in office in an older PowerPoint format.